Have you ever wondered how certain travel gurus find cheap flight tickets to visit 30, 50 or even 70 countries and still have money to spend? Finding the world’s cheapest flight tickets is not something that comes naturally to people. In fact, it is a struggle for many. You may encounter numerous articles on the internet that offer tips on how to book cheap airline tickets. But most of them are lacking in detail and barely scratch the surface of what you really need to know. As a solution, I have come up with a comprehensive list of tips and resources for booking the cheapest air tickets to anywhere in the world. I have used these strategies to book cheap flight tickets to more than 40 countries in the last 10 years and I have learned the hard way on many of these trips. Even if you don’t fly or travel all the time, being more informed about these tips will help you when the time comes. The ultimate goal of writing this article is to provide you with a free comprehensive guide to alternative flight booking strategies so that you can travel more while saving more money. Not all of the tips will work all the time, but some of them will apply to every trip you make. I am giving you not 10 or 20, but 40 tried and tested tips so that you don’t have to pay more than you want for a plane ticket EVER AGAIN. Go get those cheap tickets. 1. Use Price Comparison Sites to enhance your flight search results and cut costs. It’s easy to get overwhelmed with flight booking sites nowadays. Everyone seems to be selling tickets to somewhere. What many travellers forget to think about is the TIME they spend looking for flight tickets. If you spend about an hour per day for a week trying to find the cheapest ticket, it probably isn’t the cheapest ticket anymore! Time is money. I prefer to start out right away with a powerful price comparison site to see which airlines have the cheapest tickets. This saves hours of clicking around all over the place. Once I know which airlines have sales going on, then I can compare the most competitively priced third party websites to the actual airline ticket price. In some cases, the third party sites might be cheaper because of codeshare agreements, but if the prices are the same then I will use the actual airline site to book the tickets because I trust them more if there is a delayed flight or some kind of complication. The moral of the story is: Use airfare comparison sites to significantly reduce the amount of time it takes to find cheap flight tickets. Once you have them narrowed down, always check the airline site to see if they are the same price. 2. Instead of booking expensive direct flights, choose multi-city flights to see more places while saving some cash. For multi-city flight searches, use airfare booking sites like Momondo and Cheapoair. I am a huge fan of multi-city flights. I never used to consider them before, but now they are the way to travel. Say for instance you want to fly roundtrip from New York to Rome. There is nothing stopping you from getting a connecting flight on the way to Rome and on the way back from Rome that is about 2-3 hours in both directions. This is undoubtedly an ideal connection time. That’s how I used to think. Now, I think of this trip differently. Let’s say it costs $1300 USD to fly roundtrip from New York to Rome. Not bad, right? Currently, I try to instead think about much it would cost to fly to other destinations in Europe individually. If it costs $1300 USD every time I wanted fly towards Eastern Europe, I would be bankrupt. By booking a multi-city flight to other destinations in Europe I could see much more while saving large sums of cash. Let’s assume that I also wanted a 4-day layover in Amsterdam before reaching Rome and a 5-day layover in Frankfurt after visiting Rome. This might bring up my round trip multi-city ticket to $1800 USD. This amount is actually $500 USD more than my initial flight price of $1300 USD. I realize that $500 USD is a lot of money, for many people. But think of the future costs associated with visiting these three destinations individually. If you went to Rome it would cost $1300 USD, and separate trips to Amsterdam and Frankfurt might cost $1000 USD and $1100 USD, respectively. The total sum would be $3400 USD. Therefore, by booking a multi-city flight for this trip to Amsterdam, Rome, and Frankfurt you would have saved $1600 USD per person, or $6400 USD for a group or family of four! I highly recommend trying out some searches for multi-city flights. Some websites I have used in the past include Momondo, Cheapoair, and Etihad. When using sites like Momondo, choose the “Multi-city” option for the type of trip. Refer to the red arrow in the image above. 3. Collect and redeem Reward Miles like a Champ! I can’t stress enough the importance of collecting flight reward miles. Whether you are shopping for diapers or dining at a nearby restaurant, use a rewards card that will eventually reward you with free flights. It’s pivotal that you pay off your credit card statement every month to avoid interest building up. Personally, I use my card for almost everything I buy, and then I pay off the complete bill the very same month. Free flights, and no interest for the bank! You would be surprised how many people fly without registering for a flight rewards program. Usually, it comes down to laziness or disorganization. ALWAYS key in your rewards program number when you book your flight ticket online! I have been flying extensively around the world for the last 10 years and the only time I have flown without collecting rewards miles is when the airline didn’t have a rewards program to collect them with! This has been extremely rare. 4. Book flights that depart on Thursday or Monday instead of Friday or Sunday for weekend trips. If you are planning on booking a flight for a Friday departure for a weekend trip, you might want to see if you can shift your travel dates by a day or two. Over the years, especially with regards to Southeast Asia’s budget airlines, they have been making Friday night and Sunday flights significantly more expensive than other days. Complete a price comparison search to get a feel for the plane ticket prices before you plan your vacation or business trip – this is what I do. If the tickets are too expensive, try to use a personal day at work or another option. 5. Book flights on Wednesday. This has been ‘claimed’ to be the cheapest day to fly for years now (with some debate of course). Based on my experience flying over the years, Wednesday does indeed have cheaper fares than on the weekend for instance, but many variables are at play to just say that Wednesday is always cheaper than a given Tuesday or Thursday for example. Again, price compare early to see if this strategy works for the airlines servicing your flight sectors. 6. Book your flights on websites that are already listed in your credit card’s currency. 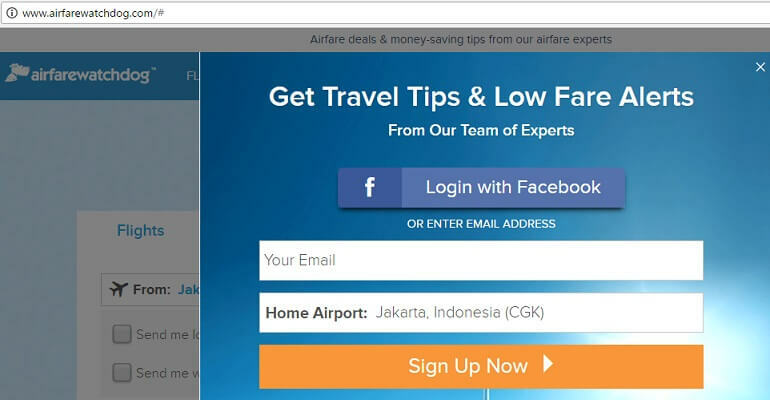 Always be sure to look at the URL of the airline booking site that you are purchasing your flight tickets with. For example, if you are booking a flight with www.cheapoair.com, they have multiple websites based on country of origin. I personally would avoid booking through the US version of a website if my credit card is from France for instance. Your credit card will charge you an additional percentage and determine the exchange rate which is often not the best for the customer. Always check that you are being quoted in your credit card’s currency. Similarly, if there is an exchange that must be done, be sure to make sure you won’t get soaked by using a website from a different country. Some websites allow you to change the currency at the top of the webpage, but this is often just an approximation of the total cost. It’s an approximation because your credit card will determine the exchange rate, not the website itself. Always use a currency conversion site to make sure you are getting a reasonable price quote. 7. Avoid peak season travel. Avoiding peak season travel is obviously easier for some people than others based on work commitments and so forth. It pays to purchase a guidebook before you plan your trip because it will easily save you some cash right away for planning to visit your destination of choice when demand is low for flight tickets. If you must travel during peak (high) season, then try to book your flight on a Thursday or a Monday, opposed to Friday night or Sunday evening. 8. Refer to ‘budget airline sites’ before booking to see if they can make your total trip price cheaper. With the rapid growth in the budget airline industry over the last 15 years, more and more people are saying ‘no’ to the added luxuries and saying ‘yes’ to budget airlines. Budget airlines have revolutionized the aviation industry. Here’s an example why. Let’s say that you live in Jakarta for instance. Jakarta is known to have pretty expensive international flight tickets – especially flights to North America, the Middle East, and Europe. For this particular flight, you want to fly round trip to Montreal, Canada. Traditionally, the only option would be to book your round trip ticket from Jakarta to Montreal and pay the total cost with a non-budget code share flight with Garuda and Air Canada for instance. Now, however, it’s much cheaper to book a round trip flight ticket with a budget airline from Jakarta to Kuala Lumpur, and then a round trip flight ticket from Kuala Lumpur to Montreal with a non-budget airline. It sounds like a crazy idea, but I know of many people (myself included) who have saved over $500 USD per person using this strategy simply because the budget airline flight from Jakarta to Kuala Lumpur is very cheap and international flights from Kuala Lumpur to the West are much cheaper than from Jakarta. Of course, not everyone will be flying from Jakarta, but I think you get the idea. Try this price comparison site to see if this plan can work to save you money from your departure city. Send us an email if it does! We always want to hear feedback regarding our suggestions. 9. When flying, embrace layovers, don’t avoid them! Some travellers just dread layovers. And for some trips, I do as well. But the more and more I travel the world, I think about whether it’s always worth paying for extremely convenient connection times? If you are busy writing a paper, doing business or running a website, is it the worst thing in the world to sit in a comfortable airport lounge for an extra 2-3 hours to get your stuff sorted? If you can save a couple hundred dollars by having a beer and a meal at an airport restaurant while getting some business done, why not? I just think that some travellers tend to think a bit too much about connection times while travelling without thinking about how they spend their time outside of the airport. Super long connections can be a real pain if you don’t have an airport hotel booked, but if an hour or two will save you some cash and some relaxation, go for it! 10. Book early and save. Everyone seems to have an answer, but the fact of the matter is that it depends on whether you are flying with a budget or non-budget airline and a whole range of other variables. Budget airlines tend to release their fares just under a year in advance with many of them having ‘release sales’. The prices then get progressively more expensive leading up to the departure date. From time to time they then might have a sale about 4-8 weeks ahead of time. Non-budget airlines, like most national carriers, usually have their prices the cheapest about 8-10 weeks beforehand. But again, this is highly dependent on what time of year you are flying, where you are flying and a whole range of other factors. In my case, I book my budget airline tickets right when I know my dates of travel after doing ‘price comparison checks’. 11. Sign up to Points.com and as many rewards programs as possible. Initially, when I started flying, I didn’t realize the importance of collecting reward points for every flight. Subsequently, when I flew with an airline that I didn’t have a reward account with (or a card) I didn’t collect the points. Now, this has all changed. Even though I know that I probably won’t get enough flight rewards for a free flight with some airlines, I can now use this handy site that I discovered called Points.com. Points.com provides travellers with various options of combining flight rewards points from different airline programs to get flights. 12. 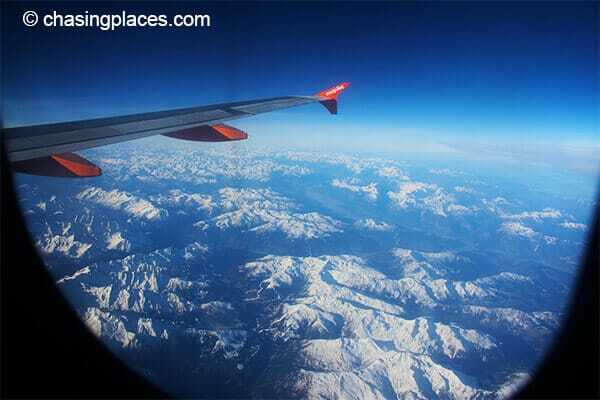 Sign up for blogs to get tips on finding the cheapest flights. There are many good blogs out there (including this one) that will try to give you information about finding the cheapest flights in a particular country you are visiting. It pays off big time to be an informed traveller. 13. Buy a travel guide for airport/flight information. I have been using Lonely Planet travel guides for most of my trips over the last 10 years. It not only makes practical sense to learn more about a given destination before you arrive, but it also makes sense to purchase them from a financial perspective. Guidebooks are cheap (they can be under $15 USD) but the tips they contain have saved me thousands of dollars over the years. Think about it. If you find out about some low-key airliner in a specific country that has much cheaper fares than the common ones found on booking sites you’ll probably save the price of the guidebook within a few minutes. Guidebooks also are efficient sources of information. Spending hours upon hours jumping from one mediocre website to the next isn’t very efficient. 14. Avoid reserving seats once you book a flight ticket with a budget airline. Budget airlines are called ‘budget’ for a reason. They are cheaper in most cases, but not all! What many tourists don’t realize is that a budget airline ticket can be more than a non-budget airline ticket if you select all of the additional choices that are available on top of the basic fare listed. Picking your seat is typically an added expense that you can avoid. I usually just show up to the airport early enough to select a seat when checking in if the flight is long enough for me to be concerned about it. Again, it’s your choice, saving money vs. additional comfort. 15. Pre-weigh your luggage to avoid extra check-in fees. Whether you are flying with a budget airline or a non-budget one, nobody likes to pay extra money for checking in excess luggage. I have seen many people over the years pulling out their credit cards in very stressful situations because they were 2-3 kg’s over the maximum weight. And yes, airlines charge a hefty price for excess luggage. Lesson learned: either pre-weigh your luggage at home or show up to the airport early and weigh your bags on one of the empty weighing scales to provide time to figure things out. If you know how much luggage you are going to bring, then don’t pre-purchase a whole pile of unnecessary excess luggage. 16. Pack lightly for your trip. I have travelled through at least 10 countries with under 7 kilograms of luggage. For many airlines, this equates to their maximum carry-on allowance. Avoiding checked luggage is particularly important if you choose to fly with budget airlines as they typically charge you more on top of the base fare for checked luggage. Packing lightly not only can save you baggage fees, but it can also avoid those annoyingly long waits for your luggage to arrive at the carousel if you know what I mean! Use smaller bottles to store your toiletries. Avoid bulky containers. 17. Sign-up for flight-price notifications. If you already know what itinerary you want to book your flight tickets for, then sign up for price notifications. Websites like Airfarewatchdog.com specialize in sending email notifications to inform travellers when the price has dropped or a sale is on. Let their technology do the searching for you, which will save you time and some serious cash. Check out Airfarewatchdog.com’s notification information. 18. Use as many flight search engines as possible (if you have the time)! 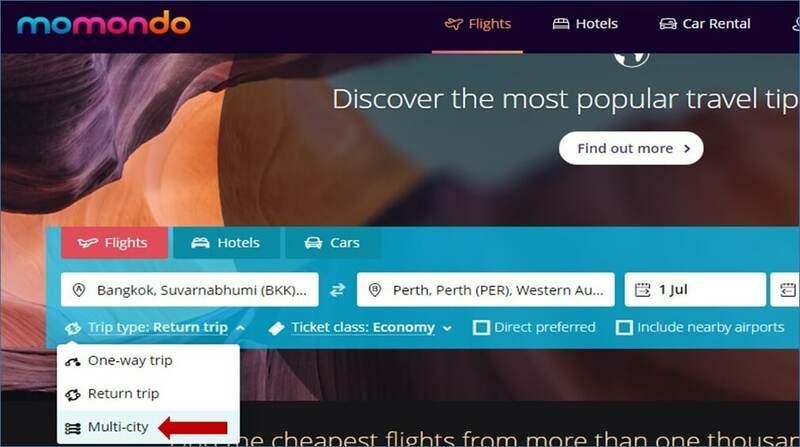 I typically stick with my favourite flight booking sites (Momondo, BookingBuddy, Airfarewatchdog) when searching online because I don’t want to spend weeks upon weeks looking for a bargain. If you have the time and patience, however, the more search sites you refer to the better odds are that you will find the cheapest available fare. But don’t all flight booking sites search the same airlines? The answer is NO! Some sites have arrangements with specific airlines and therefore only quote their prices, even though there might be cheaper fares available with another airline! I have learned this lesson the hard way. Always use price comparison sites that link to multiple different booking engines. A good example here is BookingBuddy. This way you can reduce ‘search bias’ and sites that have private partnerships with selected airlines. 19. Use monthly price charts to identify the cheapest days to travel. This tip applies to travellers that know they want to go to a specific destination but they are open to the possibility of travelling on different dates. In other words, they have some flexibility in their schedule. Instead of wasting your time searching individual days, look at the full month view. An excellent site offering this feature is Momondo. Just refer to their ‘30 day-chart’ which is placed above your search results. A sample of the 30-day chart. Notice how the yellow bars show the dates of my search, and how some of the other blue bars are shorter, and hence cheaper. 20. Search for flight prices to multiple airports within the country you are planning on visiting. If you are flying to a country with multiple international airports, like Japan for instance, always check nearby airports to see how much the price difference is. Tokyo has Narita and Haneda and the prices to fly into these two airports could be substantially different. If you are going to save over $200 USD for your flight, an extra hour on the train might be well worth it if you are not on a tight schedule. 21. Always check the individual airline site before booking with a 3rd party. Never, and I mean never, book a flight with a 3rd party without first referring to the official airline carrier’s website. For example, if you find a cheap plane ticket with Momondo to Dubai, you also need to check the Emirate Airline’s site. 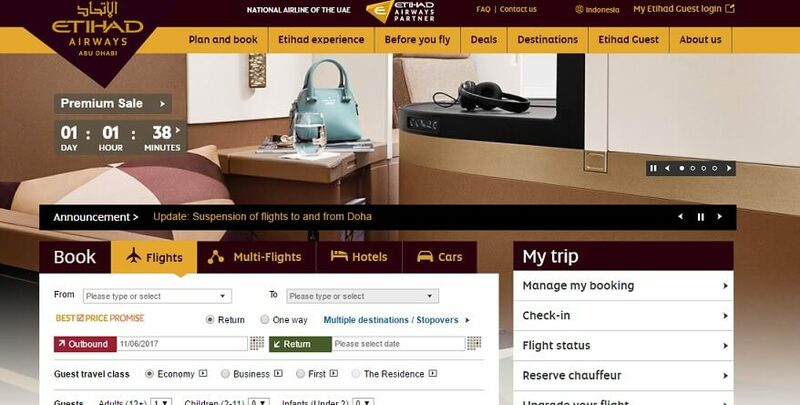 Also, visit Etihad’s site before buying that seemingly cheap airfare ticket to Abu Dhabi on BookingBuddy. Don’t get easily persuaded by discounts of 50% and 60% posted on 3rd party sites. Yes, in some cases, they are the ‘real deal’, but in some instances, or most, they’re not! By checking the official airline site, you can verify whether the supposed airfare deal on the 3rd party site is cheaper. If it is and you’re happy with the itinerary, then go ahead and book it. Etihad’s official website. One of the best airlines in the world. 22. Fly in low season when airline ticket demand is much lower. The aviation industry is similar to many other industries in that prices are based on supply and demand. Do some research and try to book flights during the ‘shoulder season’. Many budget airlines slash prices to avoid empty flights and this doesn’t mean that the weather is bad that time of year. Peak season is often determined based on school holidays and other variables aside from weather patterns. 23. Bundle your flight ticket with your accommodation to get cheaper prices. Air Asia and other airlines/websites that also offer flights and rooms often throw in some amazing discounts when you bundle flight tickets with hotel stays. Buying in bulk can pay off. However, be sure to check the hotel price and the flight prices separately before paying to ensure that the deal is legitimate and not just a marketing gimmick. I often use this hotel comparison site and this flight price comparison site to verify by adding the two lowest prices together. If the bundle price you found isn’t less than the sum of these two values, then you are obviously not really getting a deal! My favourite website for bundling flights with hotels is Cheapoair. Go to their ‘Vacations’ tab at the top corner of their search box for combined flight-hotel prices. 24. Use the right travel credit card to maximize the points you can earn for the specific flight you’re taking. If you have more than one credit card make sure that you know enough about each one to maximize your reward miles for each flight you take. Many credit cards nowadays allow you to earn flight reward points for purchasing the flight (1 point per dollar spent or instance). Then, if you also have signed up for the loyalty card you will earn rewards points for the distance you have flown (1 point per mile travelled for instance). Be a credit card-flight rewards expert. It will pay off in the long run if you travel frequently. 25. If you are flying to the Caribbean, it’s often cheaper to use a chartered airline. If you plan on flying to the Caribbean from North America, you would be surprised how cheap all- inclusive week long resort vacations are. Since flights are included in the total price, even if you don’t stay at your resort for the entire period, you might find a great deal. You can quickly check flight prices and all-inclusive trips to the Caribbean using CheapoAir. 26. Use the “willing to travel on different dates” feature on flight search websites. If you have some flexibility in your travel dates you will always be able to travel and fly cheaper. Many websites offer the choice of searching for flights on multiple dates instead of restricting your search to only one departure date and only one return date. 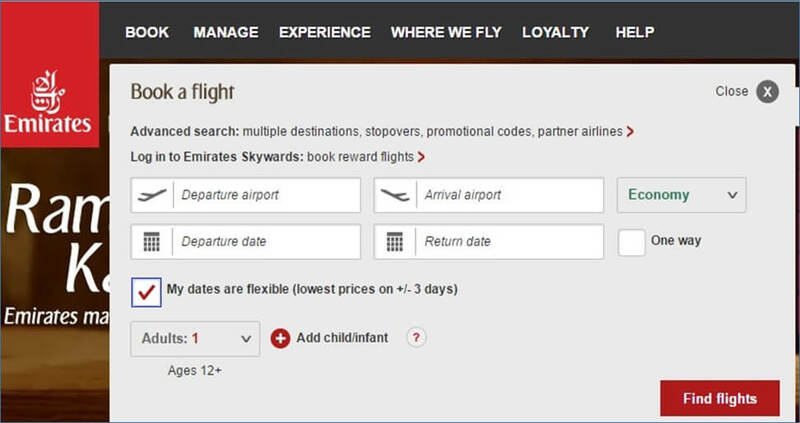 Emirates, for instance, has a search feature that states, “My dates are flexible (lowest prices on +/- 3 days)” with a box that you can tick off. If you have the option to travel on different dates then make good use of the ‘search features’ websites have designed to make your searching more convenient with the optimal goal of saving money. 27. Avoid booking with travel agents to avoid high and unnecessary commission fees. Although it’s sort of dirty, I once purposely dropped into a travel agency to see what kind of prices ‘this expert’ could find me for a round trip long haul flight. The catch was that he didn’t know that I had just finished my own price search online using some of my all-time favourite flight booking sites: Momondo, BookingBuddy, Airfarewatchdog. The result? Every price he quoted me was at least $200 USD more than the cheapest price I had found online. The lesson here is that if you’re capable of using price comparison sites then at least do a bit of searching before you put your trust behind an agent. Not all agents are like this, but it’s always better to do some searching first. If you want some additional information about airfare comparison sites, then just fire me an email or comment below. 28. Search for ‘individual tickets’, and then ‘group’ to compare the cost difference. I noticed a few years ago that it’s possible to get cheaper air tickets by searching for individual tickets and then comparing the price to when another passenger is added to the search. For instance, if you’re flying from Kuala Lumpur to Hong Kong and the price for 1 round trip ticket is $100 USD this doesn’t necessarily mean that the price for 2 people will be $200 USD. If there is only 1 seat left at a promo price of $100 USD, and the next seat available is $150 USD, they (the airlines) will often quote you a total price of $300 USD for two people to complete this trip and not $200 USD! When booking with budget airlines this can be particularly important. I used to book 1 ticket at a time to make sure I secured the final promo price for the first passenger. Play around with your flight searches. This can let you know how many promo seats are actually still available for a specific itinerary. Always be aware of the additional ‘transaction costs’ that can pop up on the final booking page if you are going to book multiple individual tickets, however. 29. Be open-minded about your potential destinations, and travel to where it’s cheap. If you have time off and you know that you want to go on a trip, then travel to where the promo flights are heading to! This is a very smart cost-cutting strategy if you live in a region and you know that you want to see all the surrounding countries eventually anyway. If you are living in Thailand and you want to see all of Southeast Asia, then go to Malaysia when there’s a sale. The next year, you can go to Singapore when another airline ticket promo pops up. Sites like CheapOair list daily flight deals. It can save you money by checking from time to time to see if any of the sales suits what you are looking for. 30. Use accommodation sites to rack up flight reward points! Sounds crazy, doesn’t it! One of my favourite all time accommodation sites(agoda.com) that I have been using for over 10 years now, recently introduced a program called ‘Agoda Points Max’. This program has allowed me to book rooms through their website while collecting flight rewards points for the various airline rewards cards that I have. This has become particularly useful for me when I am only a few hundred rewards points away from getting a free flight. With a one night stay somewhere, I can reach the next reward threshold to book a reward flight. When you go to Agoda.com you can read more information about their ‘Points Max’ Program on the upper middle portion of their homepage. Take note that you will have to create an Agoda account first (it’s for free) before you can avail of their ‘Points Max’ Program. 31. Fly through hubs and then use budget local airlines for connections afterwards. Instead of booking one plane ticket to a smaller city within a given country, try to book a ticket to the main hub and then connect with budget airlines. For example, if you are booking a ticket to Krabi in Thailand from Rome. 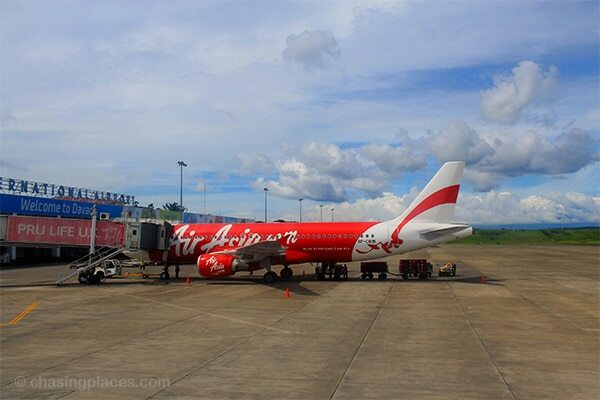 First, book your flight to Bangkok, and then take a separate domestic flight with a budget airline to Krabi. You might be surprised how much cash this can save you. 32. Never redeem a rewards flight ticket unless it requires the fewest points. I have redeemed many rewards flights before and my policy doesn’t change. If I can get an economy round trip airfare ticket for 40,000 points based on the program policy, there is no way that I would redeem the same flight on a different day for 50,000 or 60,000 points. You work hard and spend a lot of money to earn enough rewards points. Make sure that you get the best airfare deal with the points you have. This is especially true if you have the flexibility to travel on different dates. Use www.points.com to see all kinds of rewards options. They sometimes even have sales where you can fly farther than expected for the number of points you have earned. 33. Use the cheapest payment method when paying for your flight (debit, credit, etc. – avoid hidden service fees). More and more airlines and third party booking websites nowadays are using this ‘service charge’ gimmick when you want to purchase flight tickets. When you fill in all of your information and get to the final payment page, they will offer you a choice of different payment methods (credit card, their very own airline rewards card, online debit, etc.). This sounds really nice until you find out the service fee for a credit card is almost more than the airline ticket price, to begin with! I have encountered this during flight sales with Southeast Asian budget airlines. Always check to see which payment option has the lowest service fee. Airlines already know that you will be less likely to cancel your booking after typing in all of your passenger information, and that’s why you see the service fee so late in the booking process! 34. Watch out for website cookies if you keep looking at the same flights on the same websites. With advancements in technology come increased challenges for the online consumer. If you keep on looking at the same flight routes on the same websites, more and more people are claiming that the prices are being artificially inflated. This could potentially portray to the viewer that the seats are becoming limited or that the prices are starting to rise. You might want to check the price of a specific flight on multiple devices just to make sure you are getting a fair deal or go incognito on your search browser. 35. 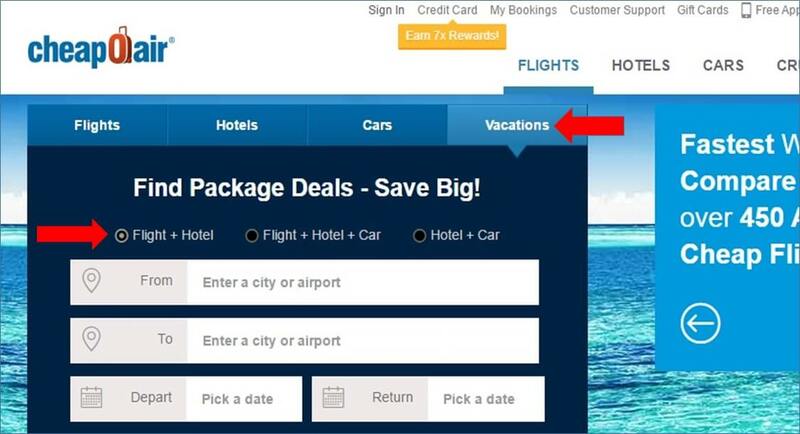 Use website booking coupons to further reduce your sale fare. Cheapoair.com is an example of a website that offers additional discounts on their air ticket prices if you can type in one of their booking coupons before paying. I have used them quite a few times over the years and it’s worthwhile. 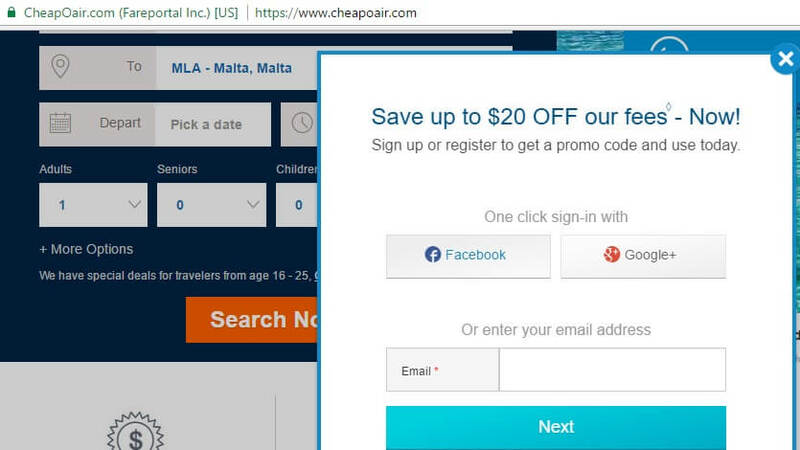 If you sign up for an account on CheapOair, you will get a promo code , which you can use to get a discount on your flight. 36. Use frequent flyer flights to get to the most remote and expensive destinations. Many frequent flyer rewards programs offer set miles to fly from one region to another region. Notice that I am not using the words country to country. What this means is that you should try to get to the most remote, and/or expensive destination within a particular region. For example, if your flight rewards program states that you have enough points to fly from anywhere in Thailand to a destination within Southeast Asia, then don’t fly to Kuala Lumpur. Why? Direct and cheap flights between popular Thai destinations (e.g. Phuket and Bangkok) and Kuala Lumpur are offered regularly. Instead, use your frequent flyer points to fly to some really remote island in the Philippines or Indonesia if possible. Sometimes these remote destinations can be challenging to book online. In that case, I just usually call the airline and tell them I want to go to a remote spot that their online searches are not finding for me. 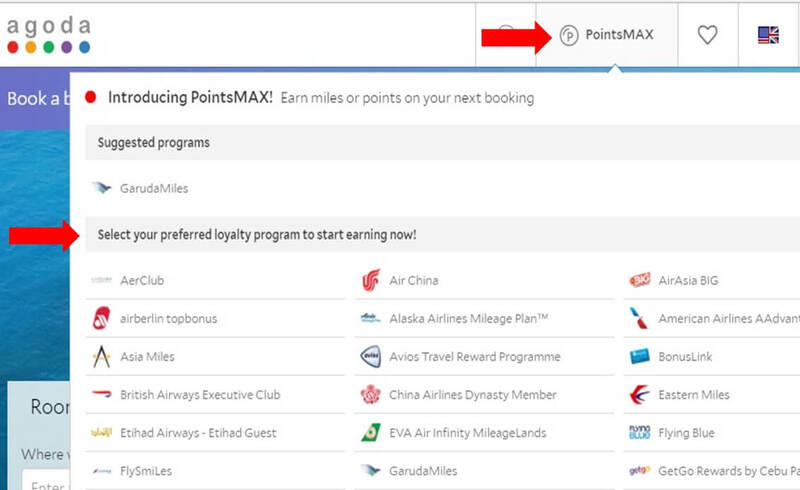 You can draft up some more interesting ideas for using rewards miles at www.points.com. You worked hard and spent lots of cash to get all the rewards points. Use them wisely. 37. Consider using bidding sites like Priceline or Hotwire. Bidding sites have been an option for the last 10-15 years. It is possible to get cheap plane tickets using sites like Priceline or Hotwire, but you have to be willing to get some inconvenient flight routes. The bidding process can also get annoying and quite tiring if your bids keep getting denied. If you do choose to bid for flights always double check with airfare comparison websites like Momondo and BookingBuddy before confirming to make sure that it is actually a deal. Remember, just because you go through the process of bidding doesn’t mean that it’s cheaper. 38. Use budget airline price comparison sites, not only normal price comparison sites. Although I have mentioned the use of price comparison websites to find the cheapest airline tickets, please remember they aren’t all created equal. Once you complete a search, take a look at the airlines coming up in the search results. If they are all well-known national carriers for all sectors of your flight, then chances are the website you’re using is not searching for budget airline flights. If you don’t want to fly with budget airlines, then you shouldn’t have a problem. But if you do want the cheapest flight tickets, a codeshare flight involving at least a mixture of budget airlines and non-budget airlines will most likely give you that. A particularly good price comparison site that searches for all types of flights (including budget airlines) is Momondo. They usually find cheap air tickets from smaller booking sites (some of which I haven’t even heard of before! ), and flights that involve budget airlines. 39. Become a ‘flight booking’ expert. I have booked over 150 flight tickets over the last 10 years. This experience has helped to compile this list, but everyone has to start somewhere. There are quality blogs/websites out there that offer excellent information on flight booking sites for you to gain a deeper understanding of finding cheap airline tickets. This resource page is an excellent example. Not only can you learn about some flight websites that you weren’t familiar with, but you might also learn about finding the cheapest rooms, trains and travel insurance along the way. 40. Try Using ‘Google Flights’ to find the cheapest destinations. More and more travellers are using Google Flights as a quick strategy for finding which destinations are cheap around the world from a specific departure point. Google is obviously known for their usage of satellite and map views. In this case, they have combined their search ‘reach’ with their map technology to produce an effective and efficient flight search strategy. 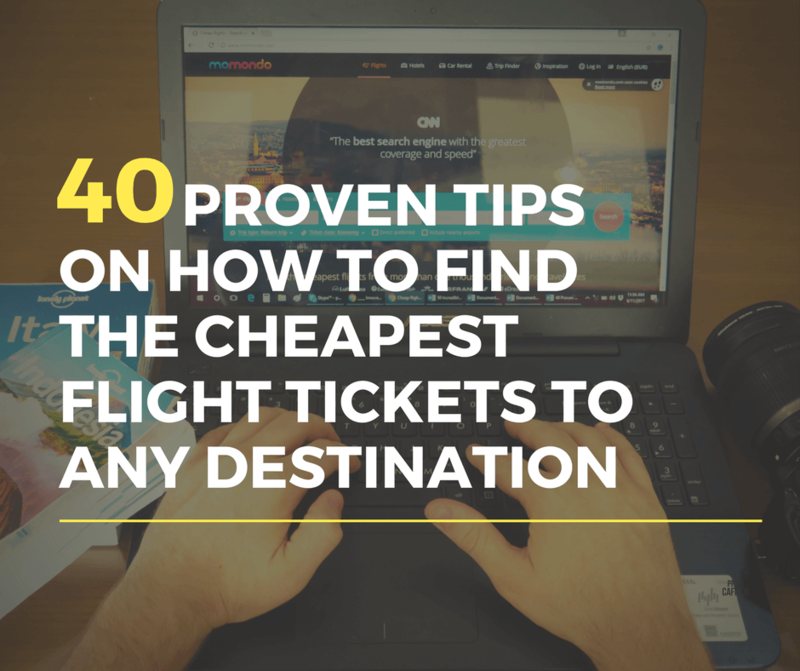 So, there it is, 40 Proven Tips on How to Find the Cheapest Flight Tickets to Any Destination in the World. If you have any questions about the strategies I have used to book flight tickets, leave a comment and I will reply as soon as I can. Thanks for taking the time to read my suggestions. Hopefully, I will see you on a flight sometime. Safe travels! Hi there! I’m Pat and I am the founder of this site. For the last 8 years, I have had the incredible opportunity to travel to over 100 destinations all around the world with my husband and travel partner. At Chasing Places, we don’t just want to talk about our travel stories; we want to help you travel smarter and better. Good planning is the key ingredient to having a truly worthwhile travel experience. 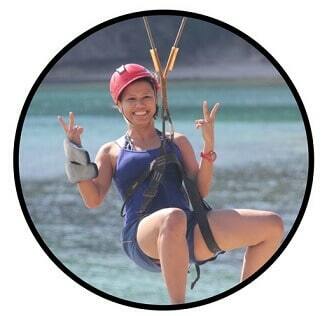 Our aim is to give you free information and proven tips on traveling to several destinations. No fluff! Excellent information…..this is probably the most comprehensive list like this that I have ever seen before. One quick question, after doing all this flying, what is your favourite airline that you have flown with? Also, what to do you think is the best ‘flights rewards program’ to be part of? Two airlines that I really like, and I would be confident enough to say that they are consistently very good to fly with are both Emirates (based out Dubai in the UAE) and Etihad (based out of Abu Dhabi in the UAE). Annually these two win travel awards for a range of categories. Their long haul flights tend to be particularly good, with their cabin crews speaking up to 15 different languages for some of the flights that I have been on. In terms of rewards programs, this also depends on how you want to use your flight rewards. Some travellers prefer to use their points for hotel stays opposed to flights for instance. I am a member of many of them, but I like Delta’s rewards program because their miles never expire! Therefore, I don’t have to waste time thinking about how I am going to use them in a given period. The big idea here is analysing how much money you spend per month. If you can pay off all of your expenditures in a given month, then get a credit card that earns you points for every dollar you spend. Payoff your entire balance monthly, and then you will get points without accruing interest. I do this with a few of my credit cards at the moment because you won’t get any flight rewards by using cash. Hopefully, these answers have provided the information you were looking for, and thanks again for asking! Please let us know if you have any other questions. Cheers to safe travels!